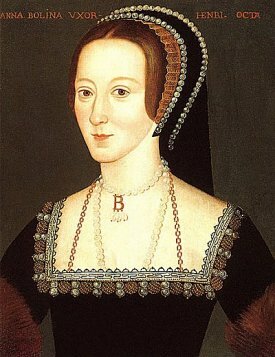 Anne Boleyn has chiefly been remembered as the wife who was falsely accused of betraying Henry VIII and getting beheaded. But not so well known about her is that she was considered to be the “patron saint” of the Reformers, who were being persecuted at the time. Anne Boleyn was born in 1507. She was educated in France. 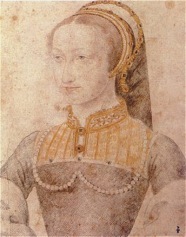 Her mentor was Marguerite d’Angouleme, later Queen of Navarre. In another place on this blog, you can read about Marguerite and her influence on the Reformation in Europe. Remember, Henry VIII broke with Rome and formed the Church of England in order to legitimize his marriage to Anne Boleyn when the Pope would not grant him an annulment from Catherine of Aragon, his first wife. 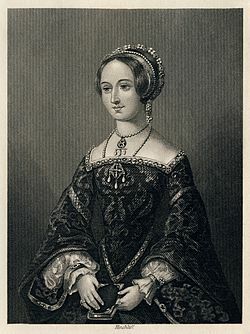 Henry, who waffled back and forth between Catholic and Reformed, depending on what he wanted, was willing to embrace some Reformed teaching in order to get his first marriage annulled and marry Anne Boleyn. Anne’s wedding and coronation took place in 1533. Anne only reigned for about three years, but she was a catalyst for the Reformation in England. She was the one who encouraged Henry to make the break. She protected and encouraged the first Reformers. Looking back in history, we can see that once the Reformation started, it was unstoppable. Anne’s emphasis was on reform, not on just breaking away from the traditional faith. Like many, she did not see why a break had to be made with Rome, if only some changes could be made for the better. For example, she saw the danger of items such as bread or water becoming objects of worship rather than just symbolic elements. Many people in her day treated them in a superstitious way, attributing power and miraculous events to them. She did not want to do away with the Biblical elements of water for Baptism or bread for Communion, just put them in their rightful place as symbols. Anne believed that the Bible should be translated into English and made available to common people instead of just the clergy. 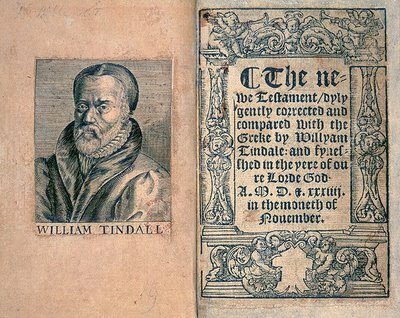 She convinced her husband, King Henry, that William Tyndale, who was a follower of Luther, was the king’s supporter and friend. This was quite a feat, since Henry despised Luther. No religious heretics were burned at the stake during the period of time that Anne was queen. However, after her death, Henry VIII had others tried and executed. (See the story about Anne Askew elsewhere on this blog.) We can only speculate on how many lives Anne saved. In her personal life, Anne was very generous and put her religion into her everyday practice. Anne distributed a fortune in charity among the English people. It has been estimated that she distributed more than £1500 per year to the poor alone. You have to multiply by about 1000 to get to today’s equivalent. So, that would be £1,500,000 or about $3,000,000. Much of this money came from the church lands that Henry confiscated. Thousands and thousands of people received assistance of some sort from Anne throughout her reign. She also sewed clothing with her own hands for distribution to the poor, and was known on at least one occasion to have personally tended to the ill on her travels. One famous story tells of a certain parishioner who lost most of his cattle. When Anne visited the parish she interviewed the man’s wife and gave her a gift of £20. (Remember this would be like $20,000 today.) Few of her biographies mention her charitable acts at any length, and these were also not much publicized during her own lifetime. After her death of course, many people were busy trying to forget her, mostly because they did not want to displease King Henry. Historians have since vindicated Anne and new books have been published proclaiming what a remarkable woman Anne truly was. Anne saw to it that her own court was run frugally. Her household was to be ordered on the grounds of equity, justice and value for money. Her staff was required to attend chapel daily and to avoid brothels and any other place of ill repute. Anne was a generous supporter of education. She made personal contributions to Oxford and Cambridge Universities. She founded a new grammar school with fee-paying and free places in the collegiate church of Stoke by Clare. Anne was considered by most of her contemporaries to be extremely intelligent, witty and charming. In addition, it appears that she had a rather droll, sense of humor. As an example, her most famous quote was spoken prior to her execution when she was amiably chatting to someone about her executioner. Reassuring the friend (and probably herself) that all would go well, she said, “I hear he’s quite good. And I have a very small neck!” Then she touched her neck and laughed “greatly”. She also referred to herself in the tower as “Queen Lackhead”. She was said to always enjoy a good laugh even, it would seem, at her own tragic end. The events leading up to Anne’s downfall are somewhat controversial. There were others who wanted more power for themselves, waiting to bring her down. There was also the fact that Henry VIII did not yet have the son he wanted. He had divorced Catherine of Aragon and married Anne in hopes of getting that son. Anne had only given him a daughter, the future Elizabeth I. Anne had had three miscarriages, including one that was definitely a boy. People were superstitious at that time. Perhaps Henry thought that Anne was bad luck. More probably, he couldn’t wait to try out another wife. He married his third wife, Jane Seymour, only eleven days after Anne’s execution. Ask Father Gahan to tell my loved ones later on that my soul, as I believe, is safe, and that I am glad to die for my country. Moments later the German firing squad took the life of the brave nurse, Edith Cavell. 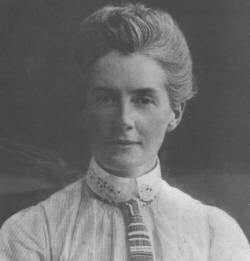 Edith Cavell (1865 – 1915) was a British nurse operating a small nursing school in Belgium, which she started in 1907. Then World War One started, and the Germans occupied Belgium in 1914. Edith joined the Red Cross and converted the school into a hospital and cared for wounded soldiers of all nationalities, even those of the occupying army of Germany. 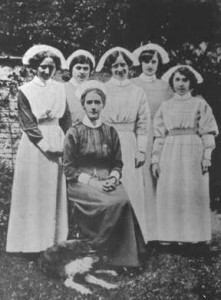 “It is our duty as nurses,” Edith said to the young women, “to care for all of the wounded, no matter from what nation they come.” Some of the nurses did not want to help the hated Germans, but Edith reminded them, “The Lord Jesus said to love your enemies and do good to those who hate you.” Edith believed that the profession of nursing should go beyond political and national boundaries. Certainly, the love of Christ should be shared with all. Some may disagree with Edith, thinking that she should have just given up the school and gone back to England. But Edith was passionate about helping others. Edith had grown up in a small town in England called Swardeston. She was the daughter of an Anglican minister. As a child, she learned the valuable lesson of helping others. There were many poor people in Swardeston and Edith often took baskets of food to them. One Sunday, her father preached from the gospel of Matthew, “And whoever in the name of a disciple gives to one of these little ones even a cup of cold water to drink, truly I say to you, he shall not lose his reward.” This sermon had a great effect on Edith; she would never forget it. Her father said, “You must also remember that some day you may be on the receiving end. You might be reduced to such straits as to be glad of a cup of cold water. You might be sick, friendless, alone somewhere where you feel absolutely forsaken. But remember that you will never be so alone that God is not there . . “ Edith would have reason to be thankful for this encouragement later. While Edith was running her hospital in German occupied Brussels, some Belgian patriots came to her and asked her to treat some wounded Allied soldiers. This would be dangerous for her, but she agreed. She hid them in some separate rooms and cared for them. Later, she helped them to escape to Holland, which was a neutral country. Over the course of the next year Edith aided hundreds of Allies in their escape from Belgium. The German secret police were watching her hospital closely in the summer of 1915, and finally on August 5, she was arrested. She was kept in solitary confinement for nine weeks. At this time a few friends brought her small baskets of food once a week. She remembered her father’s words so many years ago. Now she was on the receiving end. And she knew that God would be with her. As she stared at the four walls of her small cell, she knew that she was not alone. The German authorities interrogated Edith repeatedly. Finally, one day, after getting nowhere with their questioning, the interrogators tricked Edith. They told her that they already had the necessary information and that she could only save her friends from execution, if she made a full confession. Edith was always a truthful woman, and she believed the best about others. Edith trusted her interrogators and made a full confession. In fact, the only evidence they had was one postcard from a soldier thanking her for her help while he was in Brussels. The German authorities were ecstatic having obtained her confession. A trial began on October 7, 1915. It lasted only two days. On Sunday, October 10, sentence was pronounced. The Germans were in a hurry to carry out the sentence against Edith. There was pressure from the American and Spanish ambassadors to limit her sentence to imprisonment. They stressed the fair way that she had treated all soldiers, including Germans. They reminded them that she was not a traitor, because she was not a German citizen. All of this fell on deaf ears. The German authorities fixed the date for her execution on October 12, 1915. Edith accepted her fate. She told the English chaplain in Brussels, Stirling Gahan, who visited her the night before her death, “And now, standing in view of God and eternity, I realize that patriotism is not enough. I must have no hatred towards anyone”. After the war ended, her coffin was exhumed and taken back to England. A state funeral was held in Westminster Abbey on May 15, 1919, but her family wanted her to be buried near Norwich Cathedral, which was not far from her home in Swardeston. She is buried in Life’s Green, close to a WWI memorial. A service, attended by many visitors, is held at her graveside every October, on the nearest Sunday to the date of her death. Although the Germans thought that her death would deter others from helping Allied soldiers, their actions backfired on them. 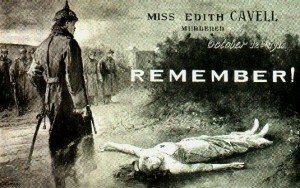 Within days of her shooting, Edith had become a heroine. She was viewed as a martyr, giving her life for others. Her execution strengthened Allied morale. British, Canadian, and Australian men lined up to enlist at the recruiting stations. Another outcome of her death was that many other lives were saved. There was a worldwide storm of protest over her execution. The Germans decided to spare the lives of 33 other prisoners. When she was a child, Edith’s father prayed with her that she would grow up to serve God in some special way. She certainly did this. Her life shows how a woman of faithfulness and courage trusts in God for protection and guidance. She was not afraid of death. She said to the chaplain who visited her the night before, “We shall meet again.” I am looking forward to meeting Edith myself. In my previous story about Katherine Parr, I gave a very brief overview of her life. I emphasized the courage that she had as the sixth and last wife of Henry VIII. It was not easy to be married to the most powerful man in the kingdom, especially when he had set aside two wives, executed two other wives, and callously remarried within only a few months after the death of the one whom he referred to as his most beloved. It is easy to see why Henry VIII would marry Katherine though. She was a virtuous and wise woman. Henry knew her family for many years. They were also fourth cousins. The Parr family had been in the inner circle of the court during Henry VIII’s reign. Katherine’s father, Thomas, was eventually knighted. Henry watched Katherine grow up into a beautiful, intelligent, kind, caring, and giving woman. Katherine had married twice and was widowed twice. She was engaged to Thomas Seymour, whom she loved deeply, when Henry set his cap for her. Of course, Henry was the king and bound to get his way. He sent Thomas Seymour to Brussels as the ambassador to the Netherlands. This cleared the way for him to marry Katherine. By this time, Henry had his son and heir, and was ready to settle down; he chose this outstanding woman to be his wife. One of the things about Katherine that interested Henry was her classical education. He was ready for a companion to spend long hours conversing with. He was also able to trust her with the regency of the country when he went to France in 1544 to fight a war. He needed someone who could speak many languages, including Latin which was the favorite form of correspondence in their day. She would not need to worry about those around her trying to take advantage of the king’s absence and putting their own agendas into place. She needed no one to translate for her. She met Henry’s expectations and did a successful job of guiding the country in his absence. Though Katherine used Latin, she was more interested in bringing the common tongue of the people into use. She encouraged the translation of the Bible, as well as church liturgies, songs, and prayers into English. She sponsored translation projects, including a treatise by Marguerite of Navarre, another erudite Christian woman of this era. You can read about her elsewhere on this Blog. Katherine published her own works, except for one poem, in English. In this way, Katherine was a cultural reformer. We know that she was a religious woman, but we do not know for sure that she favored any particular belief system at this time. We do know that Katherine was on a spiritual journey in her faith. While Henry was away campaigning in France, he left Thomas Cranmer as one of Katherine’s advisors. Possibly under his influence, Katherine became more interested in the Reformed faith. When Henry came back from France, she began pressuring him for reforms in the church. Around this time Katherine published her, Prayers or Meditations, a devotional work. It is a general Christian work, not particularly Catholic or Protestant. It contains her personal serious introspections. It was not meant to be related to any liturgical observances, but is purely devotional in nature. It was not until after she published this work that she turned completely to the Reformed point of view. It was about one year later, 1546, that an ardent Reformer named Anne Askew was put on the rack and tortured for her faith. You can read Anne Askew’s story in another posting on this Blog. Recall that the Catholic faction headed up by bishops Gardiner and Wriothesley were trying to find a way to turn Henry against Katherine for their own selfish ambitions. They sought to find a tie between Anne and Katherine. Anne refused to talk and was tortured and then burned at the stake. Gardiner and Wriothesley poisoned the king’s mind by telling him that the queen sought to be Henry’s teacher in spiritual things. Henry would not tolerate anyone, especially a woman, to be his teacher. At this point, Katherine became more careful about asking Henry for reforms. She barely escaped the plot against her life by Gardiner and Wriothesley by going to Henry and humbling herself and reconciling with him. She apologized to Henry, professing her inferiority, and assured him that she only meant to have meaningful conversation with him so he could forget the pain in his leg and also so that she could benefit from his spiritual wisdom. Though she was trying to preserve her life, she truly did believe that the husband is the spiritual head of the house. Henry was satisfied with Katherine’s response and completely befriended her again. By this time Katherine had written, The Lamentations or Complaint of a Sinner, but she wisely put off getting it published until after Henry’s death. She feared another plot by Gardiner. 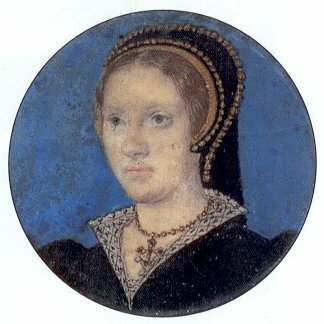 She needed to only wait a few months, as Henry died in early 1547. After Henry’s death Katherine married the man she loved, Thomas Seymour. Thomas was unfortunately not a faithful man. 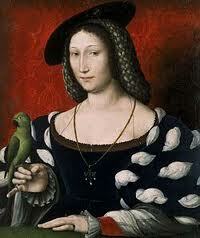 Katherine’s marriage was not as happy as she had hoped for. She loved him and supported him anyway. He and Katherine had one daughter, Mary. Katherine was 36 years old by this time. This was her first child and her pregnancy was hard. A few days later she contracted a high fever and died, September 5, 1548. Katherine reveals much about herself in her writings. It is worth getting a copy of her publications and reading them. 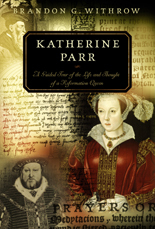 One excellent book, which contains a short biography of her and the texts of Prayers or Meditations, The Lamentation or Complaint of a Sinner, and various letters, is by Brandon G. Withrow, entitled, Katherine Parr: A Guided Tour of the Life and Thought of a Reformation Queen. Here I will quote just a few excerpts from her writings to give you a flavor of this godly woman who searched for and found faith in God and salvation in Jesus Christ. There is much more. In these prayers we read that Katherine sees the Christian life as centered on the heart. She is searching for spiritual experience and rejoicing at the same time. She asks her readers to forsake their sins, and find forgiveness in Christ. Prayers or Meditations was very popular with the Christians in England and it went through seventeen editions by 1640. “When I consider, in the bethinking of mine evil and wretched former life, mine obstinate, stony, and untractable heart to have so much exceeded in evilness, that it hath not only neglected, yea contemned, and despised God’s holy precepts and commandments: but also embraced, received, and esteemed vain, foolish, and feigned trifles: I am partly by the hate I owe to sin, who hath reigned in me, partly by the love I owe to all Christians, whom I am content to edify, even with the example of mine own shame, forced and constrained with my heart and words, to confess and declare to the world, how ingrate, negligent, unkind, and stubborn, I have been to God my creator: and how beneficial, merciful, and gentle, he hath been always to me his creature, being such a miserable and wretched sinner. “ Katherine goes on to ask her readers to forsake their former sins as she has and trust only in the mercy and grace of the cross of Jesus Christ. Katherine’s life stands as a shining example to us of what it means to stand for Christ even during difficult times. It took a lot of courage for her to follow her heart during a time when it was difficult for women to have any influence. Others who believed in her persuaded her to publish her works, and she bravely and humbly overcame obstacles in order to show others by her example what the life of a committed Christian should be. She was willing to bare her personal failures if others would also turn and find grace at the cross of Christ. Many people through the centuries have been blessed by her efforts. It would be well if women and men today would discover this remarkable Queen of England. Marguerite de Navarre lived during the early years of the Reformation. She was born in 1492 and lived until 1549. Marguerite’s father died when she was nearly four. As royalty in the French court, she received an excellent education. She learned Latin, Spanish, Hebrew, French, and English. She studied the Scriptures and classical philosophy. She was a lifelong scholar and studied the writings of Luther and Plato. She corresponded with Calvin, one of the leading intellectuals of the Reformation. Her own writings reveal how gifted she was. Marguerite wrote many plays and poems, but she is best remembered by Medieval literature enthusiasts for her collection of tales, the Heptameron, which used the device of storytelling much like Boccaccio’s Decameron. Queen Marguerite’s original intention had apparently been to write 100 stories, told over 10 days, exactly as in the Decameron, but her work was unfinished when she died. It contained seventy-two stories, hence the Heptameron. At her father’s death, her 1 year-old brother became the heir to the throne of France. (Francis I) When he began his rule in 1515, she would take advantage of this relationship to provide crucial protection for those who were being persecuted for their religious beliefs during the Reformation in France. She would never publicly claim to be a Lutheran or a Calvinist. Hoping for reform within the church, she remained outwardly a Catholic all her life. But her actions during the French Reformation proved that her private convictions were with the Reformers. She would raise her daughter, Jeanne, to be in sympathy with the Protestants. In a previous story on this Blog, you can read about Jeanne d’Albret’s fervent dedication to the cause of the Reformation. Queen Jeanne would openly engage herself with the Protestant faith and fight on the side of the French Reformers. Marguerite became the most influential woman in France. She was her brother’s confidant and helper. Francis made her a duchess, elevating her to a level in the peerage that was unusual in France, and she exercised unprecedented authority by his side. When Francis I was captured by the Spanish king after the Battle of Pavia in 1525, she negotiated his release. Two months after this, Marguerite’s first husband died. She then married Henry d”Albret. They had two children. Her son, Jean, died at an early age. Her daughter Jeanne, born in 1528, was her only surviving child. In addition to her other writings, Marguerite wrote religious poetry. Her first published poem, the Mirror of the Sinful Soul, was written in 1531. It was translated into English in 1544 by an eleven-year-old English princess named Elizabeth, the future Queen Elizabeth 1. Her mother, Anne Boleyn, second wife of Henry VIII, owned the original French manuscript. Anne was also a devout Reformer. You will recall that she was one of the wives who was beheaded by Henry VIII. Elizabeth was only a toddler when her mother was beheaded. It is interesting to think about all of these women living in the same time period. Did they know each other? Many did. Anne Boleyn had been a lady-in-waiting in Marguerite’s court. There, Anne would have had her reformist beliefs strengthened. Her daughter, Elizabeth would pay a tribute of honor to Queen Marguerite when she translated her poem a few years later. Marguerite was also a good friend to Marie Dentiere. She became godmother to one of Marie’s daughters. Queen Katherine Parr, last wife of Henry VIII was on the throne in the mid 1540’s. She was also devoutly attached to the Reformed faith. The Sarbonne condemned Marguerite’s poem regardless of her rank. But her brother King Francis saw to the continuation of the publication. Though he differed from her in his religious beliefs, he was close to Marguerite and supported her. The Catholics in France tried to get Marguerite condemned as a heretic. Grave accusations were made against her. She had taken great risks in writing religious materials, but she survived these attacks mostly due to the intervention of her brother Francis. She continued to do what she loved so much – to study theology and religion. Marguerite was very tolerant of all of the religions. She was a mediator between Roman Catholics and Protestants. She has been criticized for not taking a firm stand for one faith or the other, but she wanted to see reform in the Catholic church. She thought that it would be helpful if the people had the Scriptures and other written materials in their own language and she invested her time and money in accomplishing this. The Catholic church had been against putting their writings in the vernacular. Marguerite was also deeply concerned about the abuses of the corrupt clerics in the Catholic church, especially against women. She used her position of authority to call for an end to these practices. At the same time she did her best to protect the Reformers and dissuaded her brother, Francis I from repressive measures as long as she could. Condemned “heretics” were tortured and burned at the stake. Many fled to Navarre for her protection. Her influence radiated throughout France. Every free person, Catholic or Protestant looked upon her as protectoress and ideal. Marguerite was the embodiment of charity. She would walk unescorted, (for a queen in those days this was unheard of) in the streets of Navarre, allowing any one to approach her and would listen at first hand to their stories of poverty. She called herself ‘The Prime Minister of the Poor’. Henry d’Albret, her husband, believed in what she was doing, even to the extent of setting up a public works system that became a model for France. Together he and Marguerite financed the education of needy students. Marguerite founded hospitals, engaged in charity, and visited her territories, making herself available to her people. Truly a remarkable woman used by God. During the Reformation, God used many remarkable women. Elsewhere on this Blog you can read about Anne Askew, the martyr, Marie Dentiere, the writer, and Katharine Parr, the last wife of Henry VIII. These women could have led frivolous, selfish lives, but they did not. They risked their fortunes, love of their families, and even their lives for the cause of freedom to worship God in a way that they believed was true. Marguerite was one of the most important women during the Reformation not only in France but elsewhere in Europe. She deserves recognition for standing on the courage of her convictions. She did not take sides with either the Catholics or the Protestants, because she believed that real reform begins with the individual. She believed that theology was interesting, but holiness and integrity were the real objects of one’s spiritual journey. She devoted her life to encouraging others to know and follow the Lord. Jeanne d’Albret was Queen of Navarre from 1555 to 1572. She is not very well remembered in our day, but she is actually one of the great heroines of the French Reformation. Luther had posted his ninety-five theses on the church door in Wittenberg in 1517 and the Reformation began. During the mid-sixteenth century, while he was preaching in Germany, Calvin preaching in Switzerland, and John Knox preaching in Scotland, Jeanne d’Albret was furthering the cause of the Reformation in France. Jeanne was not a physically strong woman. She was always frail. But she had mighty courage and strength of will and more integrity than many men around her. Her reliance on God and dependence on His power to preserve her gave her the courage to stand for the right against seeming impossible odds. She was the acknowledged spiritual and political leader of the French Huguenot movement. “Huguenot” was the name given to the Protestants in France. Jeanne had grown up in a home with a father who did not care one way or the other about which religion he practiced. He only tried to please the king of France, who was a Catholic. Her mother, Marguerite de Valois, Queen of Navarre was the sister of this Catholic king. Marguerite was sympathetic to the Reformers, but she tried to make peace between the Reformers and the Catholics. Though not really siding with either religion, Marguerite used her influence with her brother to keep some of the Reformers from suffering death by burning at the stake. Jeanne, on the other hand, firmly sided with the Huguenots, proclaiming, “ A reform seems so right and so necessary that, for my part, I consider that it would be disloyalty and cowardice to God, to my conscience, and to my people to remain any longer in a state of suspense and indecision.” While many others around her were cowardly about admitting their true faith, Jeanne boldly proclaimed hers. Even her husband, Antoine de Bourbon, did not really share in Jeanne’s zeal for reform. In fact, what time did show was Antoine’s inconsistency, his constant vacillating. He was notoriously unfaithful in his marriage, and in all else as well. It became increasingly obvious that his religious views were based on his chances for political gain, just like his father-in-law. He would go back and forth in deciding which political party would give him the greatest advantage. As First Prince of the Blood in France, he and his heirs stood to gain the throne if he proceeded with care. A power struggle between Catholics and Huguenots for control of the French court and France as a whole led to the outbreak of the French Wars of Religion in 1562. When the Huguenots seemed to be gaining, Antoine would join their offensive; when the Catholics had the upper hand, he would withdraw. At last, threatened and coaxed in turn by Spain, the Papacy, and finally the French court, he renounced all dealings with the Reformers and declared himself once and for all a Roman Catholic. The gravity of his decision cannot be overstated. Besides his royal ties, Antoine was France’s Lieutenant General and was known for his amazing military prowess, but he lacked the vision to see beyond his own ambitions. Antoine’s reversal shifted the balance. Had he, the First Prince of the Blood, made himself the head of the Huguenot party, the Reformation might have succeeded in France. Because of his cowardice, there were many more bloody years of war to come. Queen Jeanne was determined to stand firm for the true faith however. Her conversion had not been motivated by politics and she would not bend. The strength of her will, put into service for God, was unflinching. While others, including her husband, cowered back to the Mass, Jeanne had Protestant services in her apartments “with all the doors open” as exasperated observers pointed out. In April 1562, the first civil war (the first of three that would occur in Jeanne’s lifetime) broke out. 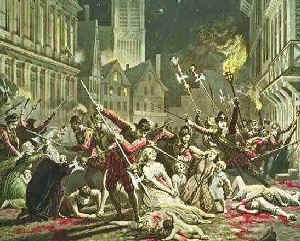 Her husband, Antoine chose to support the Catholics, but was mortally wounded at the siege Rouen. Jeanne’s son, Henry, now became in line for the throne. He would become Henry IV, and would decide to change back to Catholic. Later he would utter those famous words, “Paris is worth a mass,” as he would recant his protestant faith in order to be the king. It is sad that Henry did not have the courage and integrity of his amazing mother, Queen Jeanne. In 1567 war broke out again. During one battle, the Huguenot general was killed and Jeanne rallied the troops herself, leading them to victory. When the third civil war broke out in 1568, she proved invaluable to the Huguenot cause. She wrote manifestoes and requests for aid to foreign princes. She contributed her wealth, even offering her jewels as security in foreign loans. She supervised the care of the tens of thousands of refugees that poured into the city. She did not confine herself within the city’s walls, however. At even critical points in the fighting, she would accompany General Coligny, inspecting the defenses and rallying troops. When one Huguenot captain, La Noue, hesitated to have his arm amputated after it had been crushed, Jeanne held his hand in support during the surgery and was praised for the care she took of him in his recovery. She was working at such a frenzied pace, perhaps realizing that she did not have long to live. Her body grew weaker, but her determination was stronger than ever. Finally, in 1570, she helped to conduct peace negotiations. The Huguenots were granted more liberties than they had ever had before: “freedom of worship except in Paris or near the court, full eligibility to public office, and, as guarantee that these terms would be honored in practice, the right to hold four cities under their independent rule for two years.” Also in 1570 a marriage of convenience was arranged between her son Henry and King Charles IX’s sister Marguerite. But peace would not last. On June 9, 1572, two months before the wedding was due to take place, Jeanne died. Many historians believe that the infamous Queen Mother of France, Catherine de Medici, who wanted all of France to be Catholic, poisoned Jeanne. Later that year the horrible St. Bartholomew’s Day Massacre would take place, when thousands of Huguenots would be slaughtered. Struggles between Protestants and Catholics would continue for many years. Eventually Jeanne’s son, the inconsistent Henry IV, would effect a long-lasting peace by proclaiming the Edict of Nantes in 1598. The Massacre of St. Bartholomew, Henry’s religious vacillations, and the ultimate failure of the French Reformation — are a sad epilogue to Jeanne’s story. Because these are the historical events that people remember, they seem to overshadow the great events of her life. They really cannot overshadow her, however. She gave all to her God — her wealth, health, kingdom, and life, her heart, soul, strength, and mind — for the furtherance of His gospel. History bears out the fact that the Reformation reached its height in France from about 1559-1572, those years in which Jeanne was a part of the movement. And she has left behind a legacy of courage and unwavering faith in her service to God, and she is a good example to us for belief in the sufficiency of the Lord’s providence. “My grace is sufficient for thee: for my strength is made perfect in weakness” (2 Cor. 12:9).